When AJ Burnett decided to slam his hand against a clubhouse door, he not only lacerated his right hand, but may have also punctured the first hole in what has been an airtight clubhouse. AJ Burnett is visited by trainer Gene Monahan before exiting Saturday’s game with lacerations on his right hand (Photo: Getty Images). At first, Burnett stated that his injuries came as a result of a fall down the clubhouse steps, but once the real reason for his early exit from Saturday’s loss to Tampa was revealed, the next question became how would the rest of the team react. 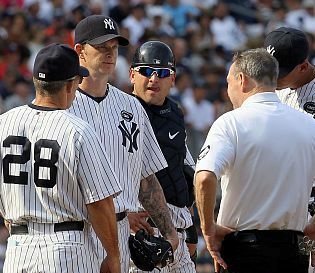 According to media reports, Girardi and Cashman both had a stern conversation with Burnett, but one wonders how the rest of the players feel. Of course, we’ll probably never know the answer to that question. Following the lead of their captain, those players queried on the incident offered only tepid relies bordering on “no comment”. Regardless of their public reaction, you can bet there was plenty said behind closed doors. Even though AJ Burnett has been very inconsistent on the mound, by most accounts, he has been a stable presence in the clubhouse that has helped transform the team’s chemistry. Everyone is aware of the pie throwing routine, but Burnett has also been credited with helping to foster more of a fun-loving attitude in the traditionally corporate Yankees’ locker room. Will such behavior be as welcomed after Burnett’s selfish act and subsequent decision to lie about it? Or, will Burnett’s presence in the clubhouse be muted? The answer probably depends on Burnett’s ability to make his next start and how well he pitches going forward. Coming on the heels of George Steinbrenner’s passing, one can only wonder how the Boss would have reacted to Burnett’s transgression. Luckily, there are two similar incidents in the Yankees past that might provide a clue. Perhaps the most notorious wall punching incident occurred on May 6, 1982, when Yankees starter Doyle Alexander punched a dugout wall in Seattle after surrendering five runs in the bottom of the third. Alexander, whom the Yankees had just signed to a four-year deal worth $2.2 million, wound up breaking the pinky on his pitching hand, which forced him to miss two months. In the immediate aftermath of the incident, Steinbrenner had little if any reaction, but that was probably due in part to Alexander’s offer to forfeit his salary while he resided on the disabled list. The Yankees gladly took Alexander up on his magnanimous offer, which probably kept him out of the Boss’ crosshairs. Unfortunately, the atmosphere of good will was extinguished when Alexander refused to remain on a rehab stint in the minor leagues beyond the required 20 days. So, when Alexander surrendered five runs in 1 1/3 inning his first game back on July 8, the Yankees’ brass was less than pleased. Steinbrenner still remained above the fray, but Bill Bergesch, team vice president of operations, stated, “What Doyle Alexander did to his teammates in Oakland tonight was disgraceful but typical of the selfishness of some of the modern-day ballplayers”. After being demoted to the bullpen for a short stint in which he surrendered only one run in over nine innings, Alexander returned to the rotation, but once again struggled. Now, Steinbrenner’s patience was starting to wear off. Finally, after an August 10 loss to the Tigers, Steinbrenner ordered that Alexander return to New York for a complete physical to determine if he was fit enough to pitch. “I am afraid some of my players might get hurt playing defense behind him,” Steinbrenner reasoned. Despite being unpopular in the clubhouse, the Boss’ heavy handed approach rallied many of Alexander’s teammates to support his cause, but the usually wry Graig Nettles had a different take. “Maybe if I’d have been sitting in the left field seats” Nettles answered when asked if he feared playing being Alexander. Kevin Brown addresses media after breaking his left hand. Behind the scenes, however, the Yankees were reportedly exploring the possibility of terminating Brown’s contract. Like Alexander, Brown accepted full responsibility for his actions, but never wound up paying a real price. Instead, Brown and the Yankees agreed to settle the matter by having the pitcher donate $100,000 of his $16 million salary to charity. Because the severity of his injury was relatively minor, Burnett’s transgression shouldn’t have the same impact as the Alexander and Brown incidents, but the stigma of selfishness, stupidity and dishonesty are nothing to be ignored. The strength of the Yankees clubhouse should be strong enough to absorb Burnett’s mistake, but if he doesn’t start pitching well, the bigger question may be about whether they can continue to abide his erratic pitching. Kevin Brown…sigh….baseball’s first $100 million pitcher, and it still happens today! Are GM’s just all in a competition to give away money? Remember Mike Hampton? Alexander is remembered for more than his share of infamous events. He only wound up on the Yankees in 1982 because he refused to report to Spring Training with the Giants. When he was finally traded to the Yankees (and rewarded with a contract extension), his popularity on the team wasn’t very high to say the least. Judging by all the teams for he played, I’d imagine that was probably the case more often than that.